Ask us about our specials before 5:00PM. Phone orders / carry-out available. Check out our menu and give us a call at (808) 892-4121. THIN GUAVA-INFUSED CRUST. Brushed with fresh herb olive oil, layered with parmesan, mozzarella, tomatoes, spiced salami and fresh arugula. Finished with dry-aged goat cheese shavings and truffle oil. ORIGINAL CRUST. Zesty Sriracha red sauce, mozzarella, salami, char siu (BBQ pork), Portuguese sausage, pepperoni, topped with fresh cilantro and cilantro aioli. THIN GUAVA-INFUSED CRUST. 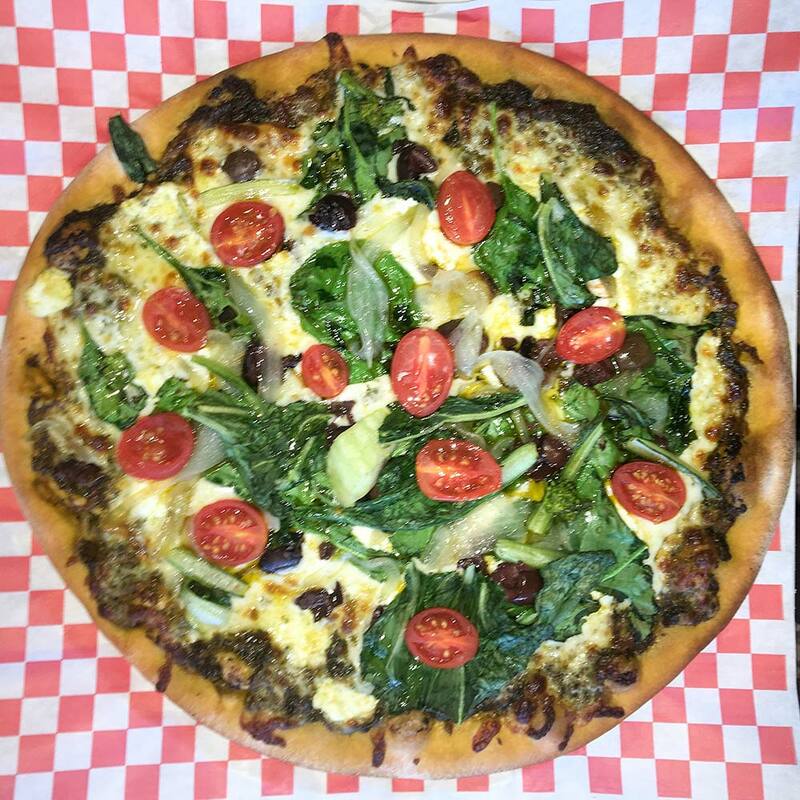 Cilantro tomato pesto, spinach, choy sum, kalamata olives, tomatoes, fresh onion, goat cheese, mozzarella and finished with a sesame oil drizzle. ORIGINAL CRUST. House red sauce, ricotta, mozzarella, Italian meatballs, pepperoni, spicy chicken sausage, bell peppers and spinach. Finished with fresh herb olive oil and grated parmesan cheese. ORIGINAL CRUST. House Red Sauce, mozzarella cheese, bulgogi (Korean BBQ beef), kimchee, green onions and oven-roasted onions. Finished with fresh herb olive oil and parmesan cheese. THIN GUAVA-INFUSED CRUST. 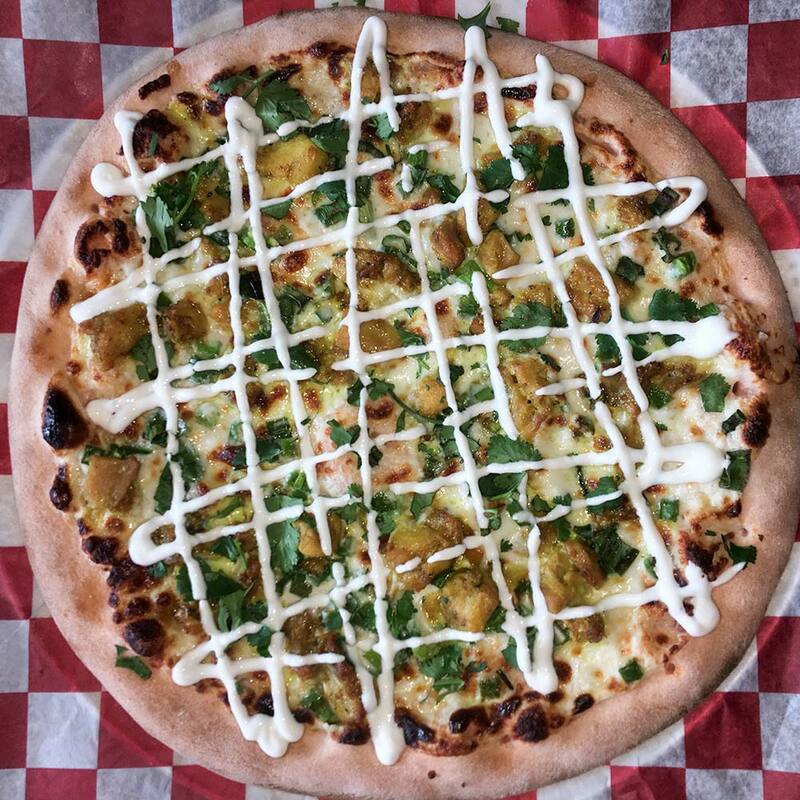 Macadamia nut cream sauce, Thai curry-spiced chicken infused with lemongrass and garlic, mozzarella, fresh jalapeños, cilantro and green onions. Finished with coconut drizzle. ORIGINAL CRUST. Macadamia nut cream sauce, mozzarella cheese, artichoke hearts, spinach and jalapeños. Finished with coconut drizzle, toasted coconut shavings and dry-aged goat cheese. Tag us! Share your experiences and pictures on Instagram + Twitter with us. Tag us in your social media with #sophiespizzeria. Maybe your photo will be featured below. We take phone orders and host birthday parties. Call us to place your order or get more information. © 2016-2018 Sophie's Gourmet Hawaiian Pizzeria // Designed with aloha by Luzod Design Co.